This city is a great sport centre hosting basketball, soccer, rugby union and Australian Rules Football. Be sure to spend some time at the Barron Gorge National Park where you can ride the Skyrail Rainforest Cableway over tropical terrain and see such spectacular sights as the Barron Water Falls at Kuranda. Also at Kuranda is Birdworld where you can marvel at exotic species. 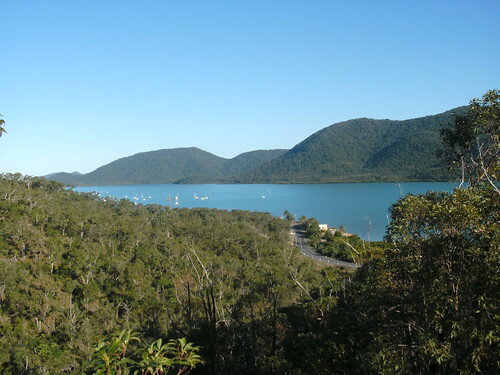 Close by is the Daintree National Park, Cairns Esplanade, with its famous lagoon. There is a host of marvellous architecture here and the Bolands Centre features on the Heritage Register. Of course you will also find no shortage of bars, restaurants, cafes and entertainment venues. MISSION BEACH A two-hour drive will bring you into Mission Beach, a stunning beach resort. It is made up of four beach villages set along 14 kilometres of golden sand and has an array of restaurants, boutique shopping, and art galleries, with a breathtaking backdrop of tropical forest. From South Beach there is a wonderful view of several islands including Hinchbrook Island which is a National Park bristling with natural flora and fauna. The beach itself is ideal for water sports and is relatively unspoilt. Wongaling Beach is the closest to Dunk Island, home of the Family Islands National Park. It is part of the Great Barrier Reef World heritage area. Set on a peninsular at Shute Harbour this is a great little resort and an ideal base for visits to the Great Barrier Reef and the Whitsunday Islands. From Airlie Beach you can experience the thrill of tandem sky diving or some great diving adventures. This is a peaceful seaside city with good vantage points for whale watching. It also boasts plenty of galleries, theatres, botanic gardens and a lively night life. Nearby are camel safaris, horse riding and sky diving. BRISBANE The river runs through the city creating green spaces. The view from the Story Bridge is sensational and there are a good many adventures to enjoy including abseiling, and adventure climbs. Culturally there is the Queensland Art gallery and great shopping and dining. Plentiful beaches complete the picture, with surfing, water parks, varied wildlife and the nearby Rainforest of the Scenic Rim. If this has whetted your appetite, there are a number of providers offering fly drive Australia packages which can be customised with your own itinerary. So pack your bags and have fun on this trip of a lifetime. David Fenn is a freelance travel writer who loves to travel overland by train and car.